Mom Speaker - Book Robin Gorman Newman Founder Motherhood Later... Than Sooner | MotherhoodLater.com - World’s leading website, eZine and community for midlife moms. 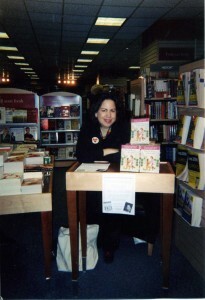 Robin at her book signing. She has led workshops at such venues as Canyon Ranch, Museum of Motherhood, Mohonk Mountain House, Learning Annex, Macy’s Herald Square, and more. Robin has also moderated talkbacks and spoken at Off Broadway shows including Motherhood Out Loud; Miss Abigail’s Guide to Dating, Mating and Marriage; Dinner with Friends; and I Love You, You’re Perfect, Now Change. Robin is available as a spokesperson for products that enhance the lives of 35+ women, moms and kids. To book Robin or if you have questions, email rgnewman@optonline.net.